Is this the 2012 SX4 (or just the VW Rocktan)? So ... is this the 2013 Suzuki SX4? We know that VW owns 20% of Suzuki these days, and the German automaker is considering an SX4-based crossover called the Rocktan. Since the SX4 is due for a redesign in 2013, one could only assume the Rocktan, assuming it actually happens, would be based on the newest Suzuki SX4. 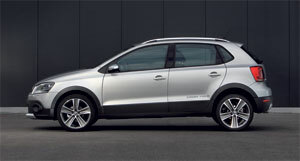 This rendering from SuzukiFan.com via Autobild, shows the VW Polo crossover. Could this be riding on a Suzuki chassis? Would Suzuki get this model, too? Regardless, it looks great to me. I say both, as long as VW does not try to bring the model over here to eat as Suzuki Sales. Lol. Sounds funny but it's true. I agree with what murphyseanm said.